In the European summer of 2002, while drinking in the enthralling view from a Santorini coffee shop, I decided that what I really wanted was to own my own boutique travel company which would be dedicated to showcasing my favourite places. 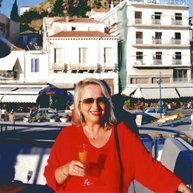 I'd spent the previous 20+ years since 1985 travelling the world, selecting and contracting the product range of some of the best-known travel companies in Australia and Greece. The time had come for Handpicked Holidays - born from a passion to show you the world I'd come to love and a desire to share my experiences there. Handpicked Holidays is a small company with extensive experience. We intend to keep it that way in order to guarantee the quality and personal nature of our service. Technology today allows our team to be home-based, in line with current trends. We find that in today's busy world, our clients appreciate being able to communicate with us at their leisure by phone, email or Skype. This works well for most clients, many of which live outside of Australia! Let us know when convenient and we'll call you - understanding exactly what you expect from your holiday is part of our service. The Handpicked Difference. - When you call Handpicked Holidays, you'll speak to genuine Mediterranean, UK and European specialist who has spent 30 years inspecting hotels, cruise lines and tour operators, selecting a range to suit all tastes and budgets. Robyn isn't an order taker - so don't be surprised if we question your choices. We want your adventure to live up to your expectations, so we'll take the time to understand your priorities whether it be the type of accommodation you prefer, keeping to a set budget, visiting special places or touring at a certain pace. Save Time - If you've ever tried to coordinate reservations in multiple destinations, you'll know how time-consuming it can be. Handpicked Holidays saves you time by handling the entire booking process. Just send us your itinerary and if you have a wishlist of places you'd like to see but not sure how best to pull it altogether, we'll suggest a logical routing, then make all reservations on your behalf using our network of partners all over the UK, Ireland and Europe. Plan Wisely - We've spent 30+ years in our profession of selecting, recommending and arranging travel services and designing logical itineraries that work. Using a travel professional is no different to using a good accountant, doctor or builder. We will consult with you, offering expert analysis of travel options you may be considering and making suggestions of our own. Talk to a Real Person - Our website is our showroom, you are very welcome to browse. If you can't find what you are looking for, please ask - you never know what we have 'out the back'! In any case, we prefer that you email or call us so that we can answer your questions or take bookings personally. The Handpicked Way. Its not what you know, but who you know and never so important as when you're far from home. Our partners and suppliers are long-term business colleagues and in many cases, I'm privileged to call friends. All are accustomed to working with Australia's best, delivering the superior level of quality, reliability and professionalism demanded by their well-known clients. They take their responsibilities and reputation seriously, so in the unlikely event that something unforeseen happens during your holiday, we know we can rely on them to offer local assistance. We are fully accredited with ATAS, the professional scheme administered by the Australian Federation of Travel Agents - Accreditation No. : A11759. Bookings made with any non-Australian entities including websites, international hotels and travel providers are completely outside the jurisdiction of Australian consumer laws. Travel insurance generally does not cover loss incurred due to the financial collapse of any transport, tour or accommodation provider. ... Get the most from your travel dollars by using a professional who has lived, breathed and worked the UK, Ireland, Europe and the Mediterranean. We’ve invested over 25 years’ of our life to our Handpicked world and bring expertise, personal experiences and most importantly – passion – to your holiday.